From Bianca Andreescu to Daniel Nestor to Helen Kelesi to Denis Shapovalov, young Canadians have often come up big on the court. Bianca Andreescu is the latest Canadian tennis player to pull off a stunning upset. The 18-year-old from Mississauga, Ont., ranked No. 152 in the world, defeated Venus Williams on Friday at the ASB Classic in New Zealand. It was Andreescu's second victory over a former world No. 1 in as many days — on Thursday she toppled Caroline Wozniacki. As a 15-year-old, Kelesi qualified for the New York tournament before downing three seeded players in a row, capped by a 7-6 (3), 7-6 (8) triumph over then-world No. 7 Sukova in the semis. Nicknamed "Hurricane Helen," Kelesi reached a career-high ranking of No. 13 in 1989, a year in which she made her second straight appearance in the French Open quarter-finals. In a Davis Cup tie at home against Sweden, Nestor shocked then-world No. 1 Edberg 4-6, 6-3, 1-6, 6-3, 6-4. At the time, the 19-year-old Nestor was ranked 238th in the world. "I didn't know I could play like that, especially in that situation," Nestor said upon returning home to Toronto. While Nestor's career-high singles ranking was No. 58, he retired this year as one of the best doubles players in tennis history. Hy, now known as Patricia Hy-Boulais, beat one of the big stars of the final Grand Slam of the season when she knocked off Olympic champion and sixth-seeded Capriati 7-5, 6-4 in the third round. Hy was ranked 36th heading into the tournament. "I've been playing very well this year," Hy, of Richmond-Hill, Ont., said at the time. "I've been able to learn from my losses. Before, against top players, I was up on them, but I could never close it out. But today, I told myself: 'If I'm going to lose again, I'll go out swinging.'" Aleksandra Wozniak beats Serena Williams, 2008, Bank of the West Classic, Stanford, Calif.
Williams, then ranked fifth in the world, was dealing with a knee injury and retired after falling behind 6-2, 3-1 to Wozniak. But even if that win comes with an asterisk, it was quite a week for the then 85th ranked Wozniak, who qualified for the tournament en route to a win over Marion Bartoli in the final. "It's great. I think I made history at home," said the native of Blainville, Que., who retired late last year after reaching a career-high ranking of No. 21 in 2009. "Everybody was watching the match. I'm just proud of being Canadian." The 6-4, 7-6 (3) clay-court, quarter-final win over Murray marked Raonic's first triumph over one of the "Big Four" — Murray, Roger Federer, Novak Djokovic and Rafael Nadal. "It's great to beat a top 10-player, it gives me great confidence," Raonic said after the win. While slowed by injuries in recent years, Raonic, of Thornhill, Ont., easily is the most successful Canadian men's player in history. His career-high ranking is No. 3. 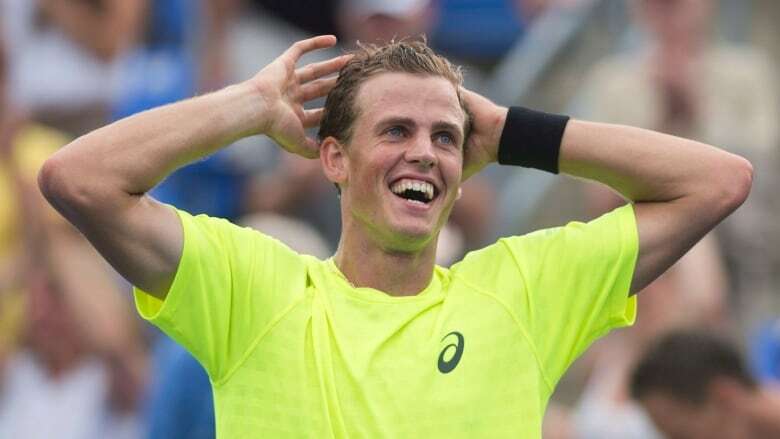 During a memorable Rogers Cup, Pospisil edged the sixth-ranked Berdych 7-5, 2-6, 7-6 (5) in the third round. It helped set up an all-Canadian semifinal between the then-71st ranked Pospisil and Raonic, won by the latter. "For my sake, I hope we'll see each other a lot more," Pospisil, of Vernon, B.C., said after the semifinal. "That will mean I'll keep up the good form." There have been only two meetings between the Canadians since, as Pospisil, like Raonic, has battled injuries. The breakout star of women's tennis in 2014, Bouchard was on a downward spiral for most of the next two years. But in Madrid, the native of Westmount, Que., beat Maria Sharapova after calling the Russian "a cheater" as she returned from a doping ban before topping then-No. 2 ranked Kerber 6-3, 5-0 (retired) as the German left the court with a thigh injury in the third round. However, Bouchard, then ranked 60th, couldn't maintain that form the rest of the year. She is currently ranked No. 87. In one of the top Canadian sports stories of 2017, Shapovalov, then 18 and ranked 143rd, stunned the second-ranked Nadal 3-6, 6-4, 7-6 (4) in the third round under the lights at a sold-out Uniprix Stadium. "It's what I dreamed of all my life growing up, playing guys like Rafa [Nadal], Roger [Federer], Andy [Murray]," the Richmond Hill, Ont., player said after the match. "You know, my dream came true today." Shapovalov is now ranked 27th as he hopes for a breakthrough year on the Grand Slam circuit.